She said this out loud, during a Monday morning sales meeting. I ain't kidding. She was a very successful copier rep.
Over on LinkedIn, there is a nice little conversation going on around books. Books that exist, and books that do not exist - books about selling MpS. In my not so humble opinion, books aren't the answer. 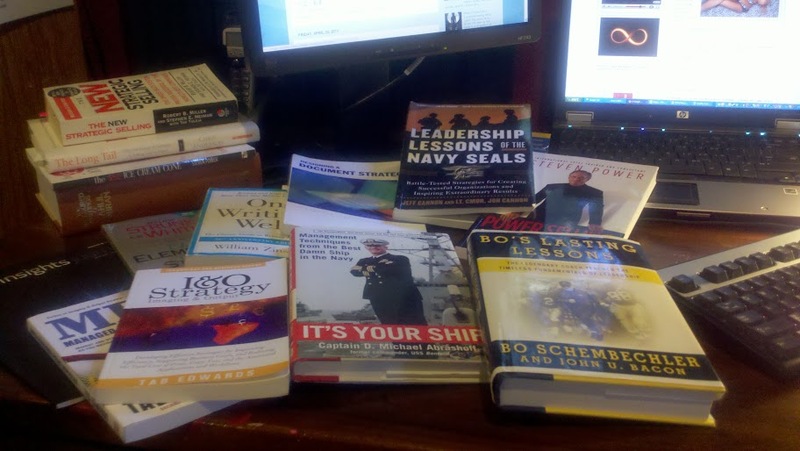 On my desk, up there in the pic, are a few of the books I have read and collected over the years. I had many, many more, but I lost them it what I loving call "the flood". Let me first say this - there are more Poser authors, cloaked in mysterious garb, than one can point a stick at. Most honestly believe what they are saying. Some even believe they are the first to utter such brilliance. I find value in most, but in some, very little. So here it is - DOTC will review "MPS: Managed Print Services" by Tad Edwards. Then we will look at "Designing a Document Strategy" by Kevin Craine and "Power Selling" written by Steven Power. Honest reflections as seen from the trenches, from the Selling Professional, and from the MpS Practice Manager. I admit, when I first heard of a book specifically written for MPS, I was dubious. 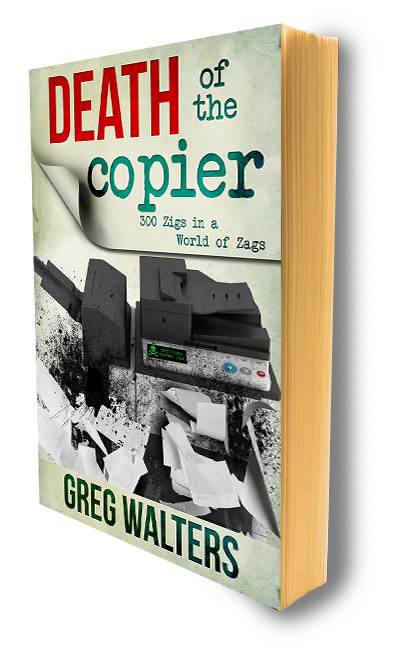 Further, when I saw the basis for the book was Total Cost of Ownership, I felt that cold tug of old-skool. I read Tab's work - twice. In a nutshell? I was not terribly disturbed and found the content utterly and completely adequate. Nothing blatantly wrong, incorrect or self serving. "...a comprehensive, bundled solution that provides convenient, reliable output to a company's end users..."
The definition is broad, albeit output and equipment centric; the elements simple and easy to see. Again, not too bad. I tolerated Chapter 6 "Total Cost of Ownership vs. Cost-Per-page" and am fond of Chapter 7, "Drawing Distinctions". The heart of this work, Chapter 8, "the 7 C's of Imaging & Output" bogged down. At sixty-five pages, the most voluminous chapter begged me to ask aloud, "is it really THIS complicated?" 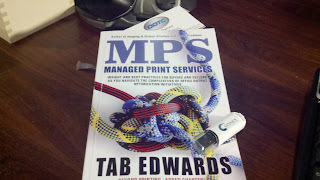 I realize MpS purity is sophisticated but I am big believer in "brevity is the soul of wit". Who the hell uses the word "copiosity" anyway? And on page 175, The MPS Process flowchart is nightmarish. I don't even care if it reflects truth, its down right fugly. I see this tome as a great introduction to MpS and most useful if presented by a leader, say...like a Sales Manager white boarding to the MpS Selling team. Monday morning or at the 4:30PM, Friday afternoon weekly re-cap(gag). Not too bad of a book. Out of five Leopard Spots, I give it 3.